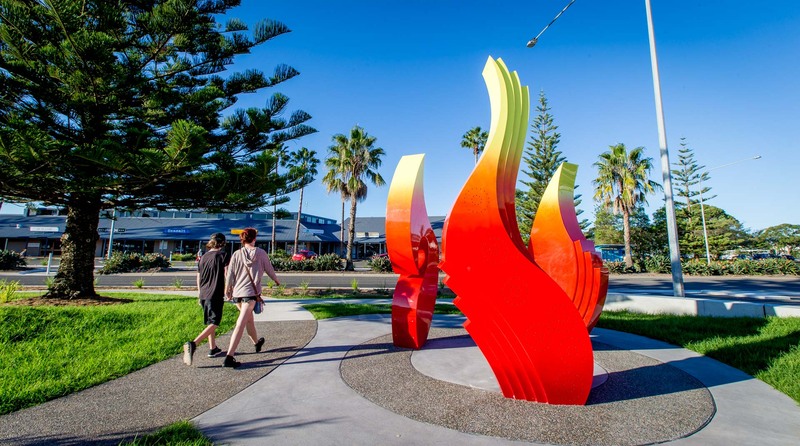 Brian Robinson’s latest public artwork, Aura of the Campfire, commissioned for the Kmart development in Port Macquarie, continues the artist’s interest in exploring the traditional Aboriginal and Torres Strait Islander spirituality, history, and cultural life that has sustained his ancestors for many centuries. CREATIVEMOVE worked closely with Kmart Port Macquarie and Robinson to commission this work. 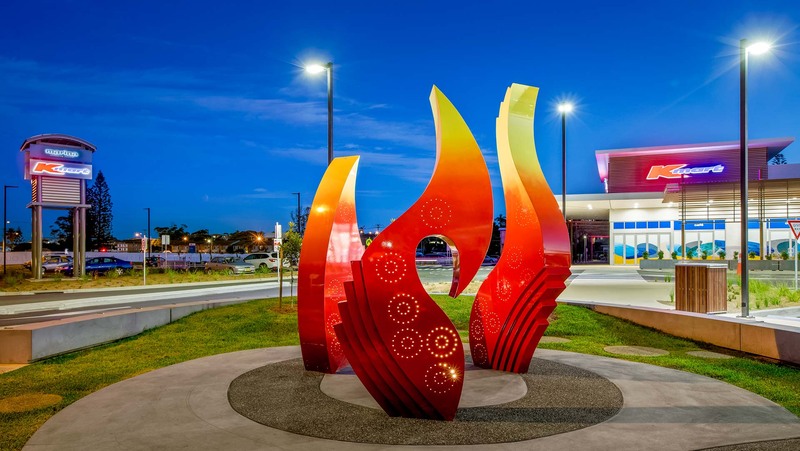 A major entry statement to the Kmart shopping centre, Aura of the Campfire acts as a signature landmark for vehicular traffic, pedestrians, and cyclists. 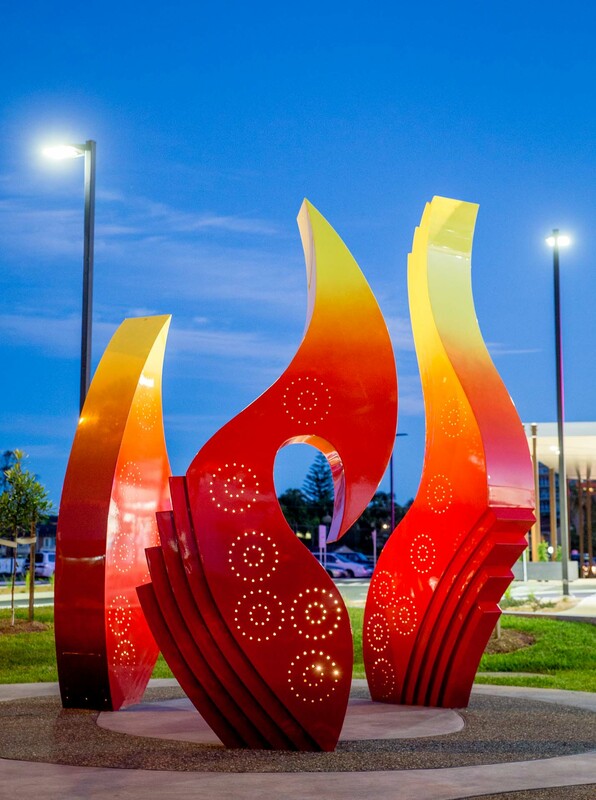 Designed as three elongated upright forms, the sculptures reference the important symbol of fire within Aboriginal culture, and are clustered together in a circle to denote a meeting place or campsite. The three flame forms also reflect the Birpai creation story of the Three Brothers Mountains, which is detailed below. Aura of the Campfire has a striking presence in both the day and night, and has been warmly received by both the local Traditional Owners and the general community alike. This high-quality commission was celebrated with a local Aboriginal dance and smoking ceremony to highlight the importance of both the work and its recognition of country. Robinson hopes that the presence of the work and its symbolic significance convey the strength and importance of the local Birpai Aboriginal Nation and culture. Brian Robinson and CREATIVEMOVE would like to thank all involved at Kmart Port Macquarie; Cian Fitzgerald of Artazan Property Group (APG); Ashok Rajendran, John Adams, and Serge Younan of Quasar Group; Mike Mooney of Stainless Aesthetics; Josh Abel from The Artificial; Damien O’Mara of DCO Consulting; and Lindsay Moller Productions. According to myth, when the land was flat, there was a large lake whose spirit was the mother of three brothers, Dooragan (the eldest son), Mooragan (the middle son), and Booragan (the youngest son). Booragan had more favour in his mother’s eyes than his siblings. As part of their initiation, the boys were fostered out to other clans among the Birpai Nation. Dooragan was fostered out to the Stingray People in the north (Point Plummer); Mooragan to the Crab People, also in the north (Lake Cathie); and Booragan to the Shark People of the south (Diamond Head). On their way north, Mooragan tried to persuade Dooragan to help him kill their youngest brother so that he might find more favour in his mother’s eyes. Dooragan refused, but this didn’t stop Mooragan fleeing to the south to kill Booragan. The Willy Wag Tail saw what had happened and upon telling the boys’ mother, she got very angry and killed the two older brothers for Booragan’s murder. Soon afterwards, she realised her mistake and grew very sad. When Gumal the Eagle heard what had happened, he became very angry and, as punishment, he turned the three brothers into mountains, which are today known as the Three Brothers Mountains: North Brother, Middle Brother, and South Brother. As punishment for her actions, he turned the mother into Comboyne Mountain, which overlooks the Three Brothers, damning her to forever see her mistake.